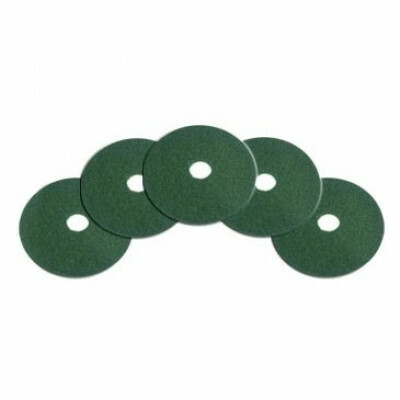 These green heavy duty scrubbing pads are used to remove the top coat of wax with use with a heavy duty chemical. Use these pads only on the most heavily soiled floors, like automotive repair shops. These 10 inch pads are to be used with 20 inch twin disk scrubbers or 10 inch buffers. For other pad sizes and scrubbing options, please view our full line of floor scrubbing pads. Customers who were interested in the 10" Green Deep Scrubbing Floor Pads - Case of 5 were also interested in the following items. This is a review for the 10" Green Deep Scrubbing Floor Pads - Case of 5.